President Emmerson Mnangagwa’s administration has been plunged into another crisis after the Zimbabwe Congress of Trade Unions (ZCTU) yesterday called for a general strike to protest against its “disregard” for workers. ZCTU president Peter Mutasa told the Daily News yesterday that the main labour body was mobilising its stakeholders to support the general strike, whose major objective is to show solidarity with government workers who are demanding better pay and improved working conditions. With the country hurtling towards general elections to be held not later than August this year, the cash-strapped government is already faced with industrial strife as almost all civil servants are demanding salaries that are consistent with the poverty datum line (PDL), estimated at about $600. The lowest earning civil servant is presently taking home below $300, way below the PDL which represents the cost of a given standard of living that must be attained if a person is deemed not to be poor. Only last month, doctors staged a strike that almost collapsed the country’s health delivery system until government gave in to their demands for a salary raise. Nurses in public hospitals are currently on a crippling industrial action, demanding improved working conditions, while teachers have also threatened not to re-open schools for the second term next month if their salaries are not reviewed upwards. Mutasa told the Daily News yesterday that Mnangagwa’s government had shown insensitivity towards the plight of civil servants and the general labour force at large. “What civil servants are demanding is legitimate, especially when one looks at the mockery of salaries that are being earned by doctors, teachers and nurses juxtaposed with the rate at which prices of basic commodities have been skyrocketing since September last year hence we have concluded that the best way forward is to protest in a very huge way,” he said. Asked if the call for the general strike was not political in view of the fact that the union is linked to the main opposition party, the MDC, Mutasa said their action was being driven by market forces. “It is not about elections but the dictates of market forces, which have not waited for elections. 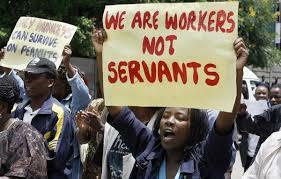 At times one wonders how civil servants survive on the meagre salaries they are paid,” he said. “We are therefore out to tell those who have assumed the reins of power that we gave them enough time when they asked for 100 days. We are concerned that during the grace period, they have not shown an appetite to treat workers fairly and hence the resolution that we address them in the language we think they will understand better,” added Mutasa, while calling on members of the public to join in the industrial action. “We encourage everyone to be part of the strike whose dates and logistics we are still consulting on. We want kombi drivers, vendors and everyone else to be part of that because with nurses currently on strike, our health is not guaranteed even as we sell our wares in town. We need to stand up in solidarity with the health workers,” Mutasa added. It is not the first time that the ZCTU has called for a general strike or mass protest to press government to addressing its concerns. Its mass protests were a huge success in the 1990s when the country’s economy used to fire from all its cylinders. The mass protests started losing their gravitas when job losses spiralled through the roof in the last 18 years on the back of company closures and retrenchments torched by an economic meltdown suffered under former president Robert Mugabe’s rule. It would, however, appear that the union wants to capitalise on the groundswell of discontentment in the civil service to push through its agenda, whose timing raises a lot of eyebrows. The ZCTU became the springboard on which the main MDC party was formed under the leadership of its then secretary-general Morgan Tsvangirai (now late), who assumed leadership at its formation in 1999. The call for a general strike comes as the Apex Council — the umbrella representative body for civil servants — has been engaging government, demanding a salary increase that can cushion civil servants against the high cost of living, fuelled by price increases of basic goods and services experienced towards the end of last year. The Progressive Teachers Union of Zimbabwe (PTUZ) argues that teachers have lost hope in Mnangagwa’s administration despite his pledges when he took over from Mugabe, whose regime was rocked by frequent job actions. When he was inaugurated as president on November 24 last year, Mnangagwa promised better working conditions for civil servants and said his government would commit itself to paying annual bonuses. But 100 days later, there has not been any marked improvement, amid reports his government is trying to placate the military which helped him assume power from Mugabe by addressing transport problems, reviewing their salaries and providing better houses for them as part of sharing the spoils of Mugabe’s ouster. “We are very disappointed as teachers. The president has seen everyone who matters except workers but for any economy to function, the government needs workers. There is nothing positive in this new regime; our conditions are worse now. We demanded a salary increment as of yesterday, workers are suffering — the government must engage us,” PTUZ secretary-general, Raymond Majongwe was quoted saying recently. “They are dillydallying with our bonuses. We have suffered enough. They must brace for action from teachers, who are suffering,” he added.